Soil is a resource that humans definitely take for granted. The soil is integral to the process of growing crops and farming animals – i.e. two huge areas of the agricultural sector that are absolutely necessary for human survival. There are even suggestions that soil can positively impact climate change. Despite the evident value of soil, land contamination is an issue we are facing due to our harmful industry practices. In this week’s blog, we are examining all sides of the soil pollution problem: what it is, what it impacts, and how to do your part to reduce it. Soil pollution (also referred to as land contamination) is defined as the condition in which the land and soil present an existing or potential risk to our health or the surrounding environment. It is often linked to the fact that in the affected area, contaminants (such as chemicals and waste) are present in levels that are above the acceptable amount. Food security is defined as the state in which people have access to a sufficient amount of nutritious and safe food. To produce the food required to achieve food security, agricultural sectors must therefore have a sufficient number of crops to satisfy the relevant population. The problem with soil pollution is that it threatens these crops that are meant to provide us with food security. Soil pollution can cause erosion, loss of nutrients and increased toxicity. The soil then affects the crops in a similar way. At its worst, soil pollution can lead to the production of unsafe or poisonous foods, which ultimately threatens food security. The fact that polluted soil is a less friendly environment for living organisms to grow means that the soil does not bind together as well. In other words, it erodes. The erosion of soil then increases the likelihood of toxic dust, which can be described as particles of the contaminated soil being carried by the wind. This makes the air unsafe for humans and animals, as the toxic dust can be inhaled. Pollutants can also travel to nearby groundwater through the soil. This process is known as leaching. Leaching can occur in farms and fields, manufacturing and disposal sites. The issue of chemicals leaching into groundwater is worrying; groundwater makes up around a third of Australia’s drinking water. The fact that polluted land can impact air, water and food is extremely dangerous news for humans; these are the resources that are most integral to our survival. Soil enters our bodies through digestion, contact with the skin, inhalation and indirect contact. Polluted crops also affect animals for the same reasons they affect humans. Again, this disruption of the natural ecosystem has a negative effect on farming and agriculture. Depending on the given environment, it can take anywhere from 200-400 years to form a single centimetre’s worth of soil. In order for enough soil and resources to accumulate and become fertile, it takes 3000 years. Hence, soil is considered to be a non-renewable resource. That is, once the soil has been destroyed by pollution, it will not regenerate fully in a sustainable amount of time. In turn, this causes economic losses for the agricultural sector. Sections of land may no longer be used due to the length of time it takes for soil to regenerate its original nutrient-rich properties. This caps the amount our farmers can safely produce. If land pollution becomes more prevalent, this will cause loss of resources, revenue and jobs. What are my legal obligations when it comes to soil pollution? All owners of land in Victoria are responsible for maintaining the quality of their soil and managing the activities that might threaten this. There are various laws, guidelines and codes that help prevent soil pollution, such as the Environment Protection Act 1970. The Environment Protection Act 1970 dictates the fineable offences related to pollution or permitting environmental hazards. This Act in particular governs farm and agricultural waste in Victoria relating to soil. If you notice the signs of soil pollution or any other type of contamination, you should report them to the Environment Protection Authority (EPA) of Victoria. 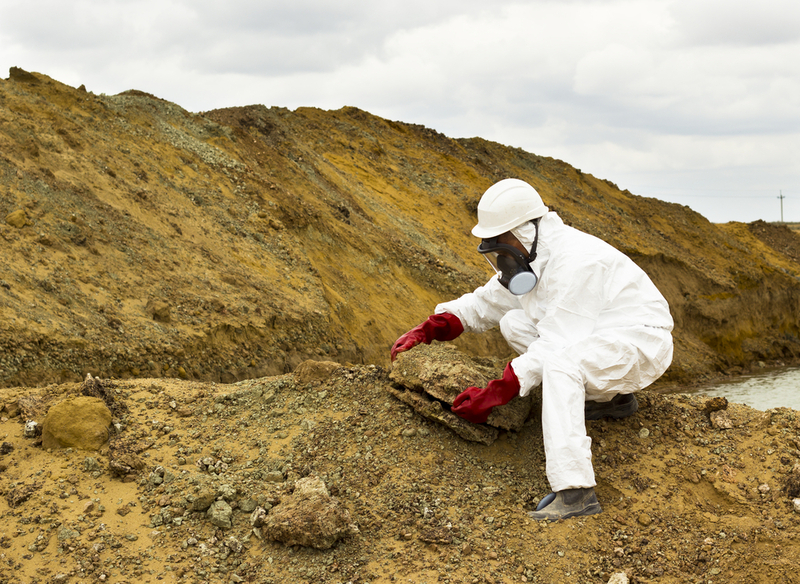 Getting a soil assessment can help you determine whether your site is polluted. What can I do to reduce land pollution? A bio-fertiliser is a substance containing living microorganisms. When it is given to plants, soil and seeds, it increases the supply of nutrients to the host plant. This is a much healthier fertiliser option for our environment (as opposed to chemical fertiliser). Chemical fertilisers – while they do increase crop yield – actually cause the soil to lose its valuable fertility. Aside from the effect on soil, chemical fertilisers are harmful to other aspects of the environment, too. In areas with high rainfall, for example, chemical fertilisers can pollute groundwater and waterways. Chemical and oil spills do occur in the areas that are most synonymous with soil pollution (i.e. agriculture, waste disposal, mining and other industrial activity). And spills don’t just affect soil integrity – they’re a pollutant of groundwater as well. One way that you can reduce the likelihood of an undetected spill is to conduct regular inspections of your chemical containers to ensure there are no leakages. You should also ensure each chemical is clearly labelled and that the lids are firm and secure. Another area for review is your waste disposal method. Are you disposing of the chemicals in a way that is as environmentally friendly as possible? Perhaps the best way to reduce the chance of a spill is to only use chemicals when absolutely necessary. It can be helpful to review your stock levels and assess whether you really need that new batch of chemicals. You’ve heard the phrase ‘Reduce, Reuse, Recycle’ a thousand times, but it really does mean the difference between saving and losing resources that keep our agricultural sectors running. Australian landfills handle around 50 million tonnes of waste every year and thus, landfills are a source of pollution to surrounding areas. Reducing your individual waste will reduce how much rubbish is sent to landfills. Therefore, this is another measure you can take to help preserve soil. If the minimalist lifestyle seems like too much to take on board at first, you can begin reducing your waste in smaller ways first. Recycling is the process of converting waste into new materials or objects. The process of recycling involves sorting your waste and disposing of it accordingly. An example of this is only putting recyclable materials in the recycling bin so that they can be reused. Reducing soil pollution is synonymous with reducing the number of chemicals we use – and waste. Implementing an organic compost system for your workplace or home is a great way to nourish the soil naturally while reducing the amount you waste. Manure is another common soil additive that is natural and can easily be found on farms where livestock is kept. When using manure as a soil additive, be wary that crops cannot grow on the soil straight after application. At least three to six months should be allowed between applying manure and growing crops to prevent the risk of contamination. You should also ensure that the area in which manure is being applied is not posing a risk to the nearby groundwater. How do I know if my soil is polluted? Knowing the state of your soil is an important step in creating a pollution protection plan. There are a few different ways you can test the soil for yourself, however, if you are really concerned or unsure of how to handle the situation, you should be looking into booking a professional soil assessment. Alpha Environmental are experienced environmental consultants based in Melbourne. We provide a variety of services related to soil testing, including soil assessment, clean up and remediation. We are dedicated to keeping our environment clean and rich in a cost and time-effective manner. Don’t hesitate to call us on 1300 039 181 or enquire online today.